This planet is a beautiful place and the terrain and scenery varies immensely all around the world. Visiting the amazing mountains, deserts, oceans, river valleys, and other fabulous places on this earth is incredible up close and personal, but nothing may compare to seeing these sights from high above them. This new perspective can lend a certain magic to what lies below. Mountains change into enormous jagged masses of land and peaceful rivers can be seen snaking on for mile after mile. The world seems to stretch on forever and things are revealed that can’t be experienced on the ground. One of the most magnificent ways to view just how enormous and grand this world is from the basket of a hot air balloon. No noise of an airplane’s engine with the view obscured by clouds – just silently floating above the Earth with nothing but breathtaking landscapes or cityscapes below. Here are five of the best places to experience from a hot air balloon. Napa Valley is one of the premiere regions for wine in the world, rivaling those of France and Italy. While great wine, gourmet food, and five-star accommodations can be found here, another plus is being able to view this wonderful natural setting from above. A balloon ride in Napa Valley soars over fields of yellow sunflowers mixed in with squares of brown earth not yet planted. Besides the vineyards there is mix of deep green valleys and olive groves. Lucky passengers may be taken down into a flower-laden meadow to enjoy a glass of Napa Valley wine. Some may consider that the hot and arid climate of the Australian Outback is brutal, but it is also hard to deny its beauty. The Great Red Center as it is known goes beyond the average definition of “desert.” A balloon ride provides sweeping views of the amazingly red soil and of Uluru, also known as Ayers Rock. Ayers Rock is probably the most famous landmark in Australia. From a balloon tour taken at sunrise or sunset this sandstone rock formation seems to almost glow red. Cappadocia has a very unique landscape plus weather conditions that are conducive to hot air ballooning, making it one of the most well known places in the world for this endeavor. The experience here is considered to be like a dream because of the strange limestone mountains. Other formations that resemble chimneys and cave churches are spread throughout deep valleys and groves of olives. 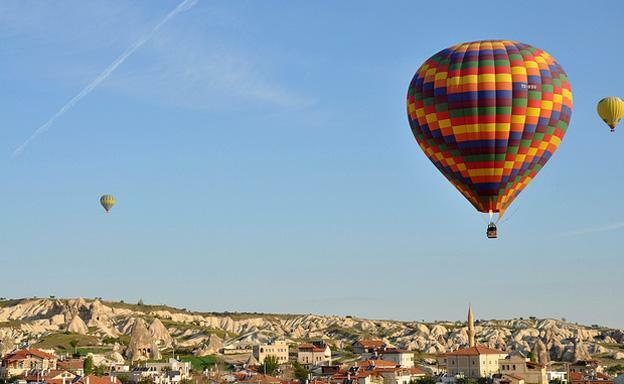 As with many hot air ballooning areas, dawn is the best time to experience the beauty of Cappadocia. Maasai Mara is sprawling national game reserve in Southwestern Kenya. It is famous for the Great Migration of game that occurs here every July to October. Literally millions of gazelles, zebras, and wildebeests migrate through this reserve to find water. While something of a phenomenon when seen at ground level, it is even more spectacular from the gondola of a hot air balloon. It is such an essential part of any visit to the area this time of year that it is often part of the itinerary when planning a Kenyan safari. Wadi Rum in southern Jordan may be better known as the Valley of the Moon. It is a hodge-podge of sharp peaks and rose-colored sandy plains. 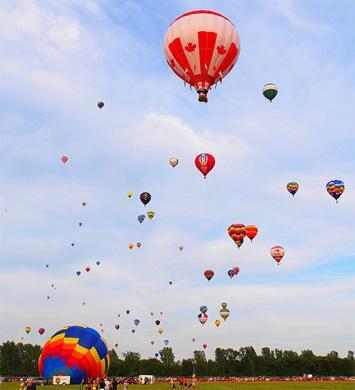 This is a perfect place for hot air ballooning because it has such a variety of things to see. From heights of 7,000 feet there are awe-inspiring views of not just the desert but the unusual rock formations, natural springs, and sand dunes. Since it is so close to the border with Israel, views of the Red Sea can be seen as well. Brent Davies the author of the “The World’s Top 5 Air Baloon Trips” is also a full time brand promotional specialist and avid blogger who writes for Search Marketing Zone. We did one in Egypt that was awesome! Unfortunately missed the chance to do one in Turkey but hopefully will be back there again next year. I really want to feel the thrill and excitement of balloon ride. Thanks for writing such a nice blog.